5 ways to this very lazy Russian dish. Zapekanka means the world to Russians. At the school canteen or on the dining table at home – you can find it anywhere. 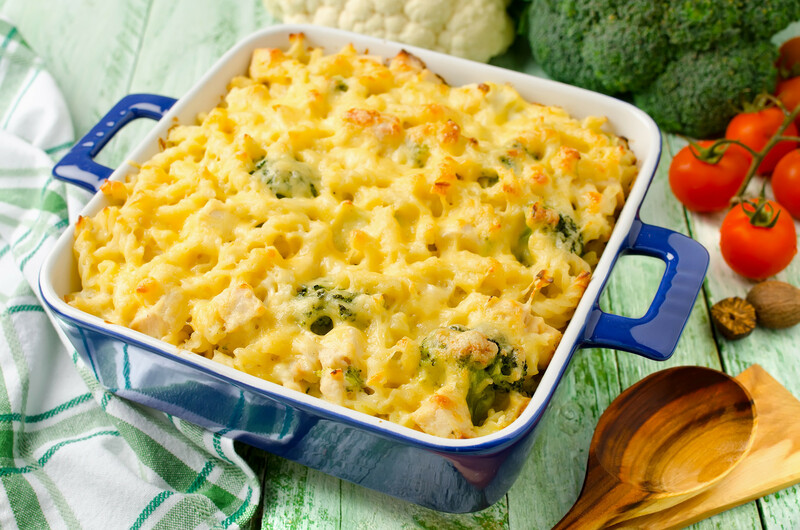 Basically, Russian zapekanka is a type of casserole – it’s an oven-baked dish consisting of different ingredients. The best thing about zapekanka is that you can prepare it with almost any combination of ingredients so it’s usually called a “leftover dish”. Any vegetables in the fridge from the previous week? Make zapekanka. Boiled too much pasta for dinner? Never mind, use it for delicious cheesy zapekanka. Here are five variations of the recipe to fit every taste. 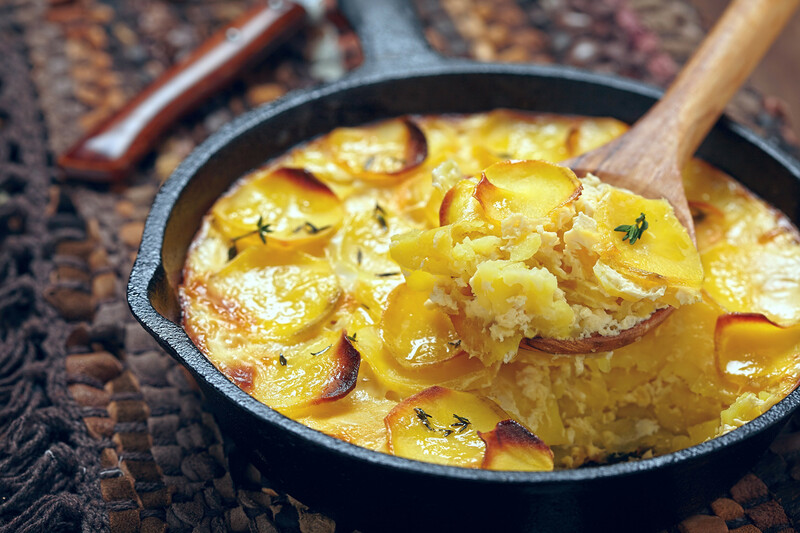 I would call it gratin a-la Russe as it is quite similar to the iconic French recipe. The difference is in adding some beloved Russian ingredients such as sour cream and onion. So say goodbye to your diet and enjoy this delicious creamy dish as a great garnish or on its own. Cut the potatoes and onion into thin circles. Mix the sour cream, finely chopped garlic, and seasonings, and butter a baking pan. Now layer your zapekanka: Potato slices, onion slices, sour cream mixture, grated cheese. Repeat the layering until you run out of the ingredients. Bake in the oven uncovered for 60-80 minutes at 180°C until the potatoes are golden-brown on top. Russians often start the day with eggs and tvorog – this type of sweet zapekanka is a great way to combine both. Mix the tvorog, half the sour cream, semolina, egg, sugar, vanilla, and salt in a bowl and set aside for 10 minutes to let the semolina rise. Butter the baking pans and sprinkle with semolina. Put the mixture into the pans and cover the surface with the remaining sour cream. 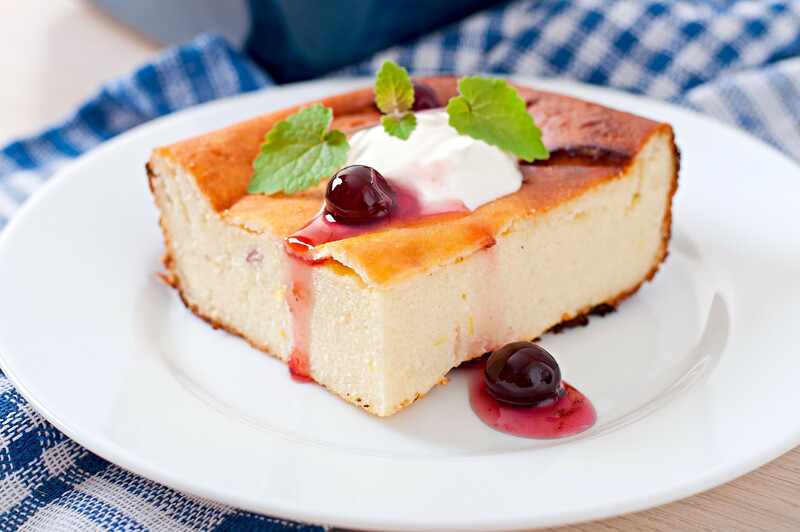 Bake for 30-40 minutes at 180°C, let it cool, powder with some icing sugar, and serve with sour cream or jams. If lasagna had been created in Russia it would have been called makaronnik or zapekanka with pasta. To make cheese sauce melt the butter in a pan and add the chopped garlic. Next add the flour and stir the mixture on a medium heat for a couple of minutes. Now start pouring the milk in a pan, keep stirring the mixture until you have a nice and smooth consistency. Bring to the boil, add seasoning, and leave on a medium heat for about 10 minutes. Meanwhile boil pasta until it’s al dente. Then turn off the heat and add the grated cheese to the sauce leaving a handful for sprinkling. You should get quite a thick and goopy texture. Finally mix the pasta with the sauce, put in a baking pan, sprinkle with the remaining cheese and bake for 30 minutes at 180°C until the zapekanka is golden-brown on top. Cabbage is an absolute essential on the Russian table. It is a must-ingredient for soups, salads and side dishes so there is no wonder they came up with even cabbage zapekanka recipe. Whisk eggs, sour cream, flour, cornstarch, salt and pepper. Slice cabbage into strips and season it with salt. 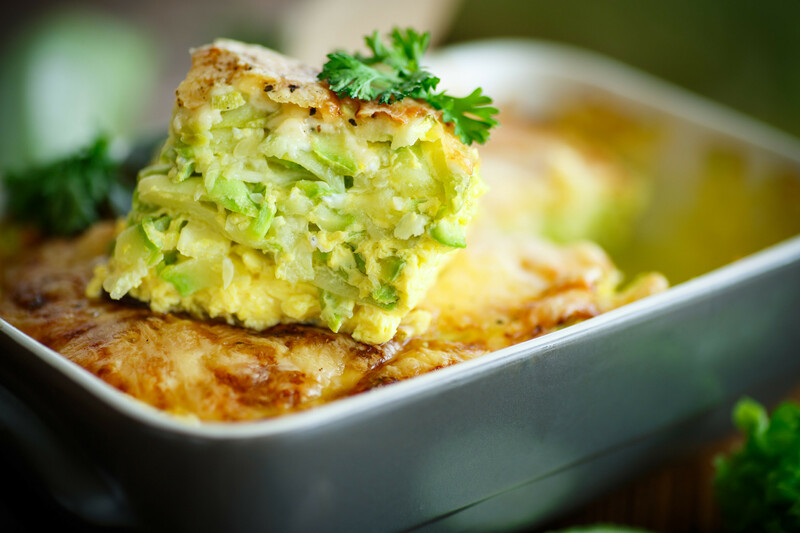 Butter your baking pan and layer sliced cabbage on bottom. Then pour the creamy filling and sprinkle with grated cheese on top. Bake 30 minutes at 190°C. 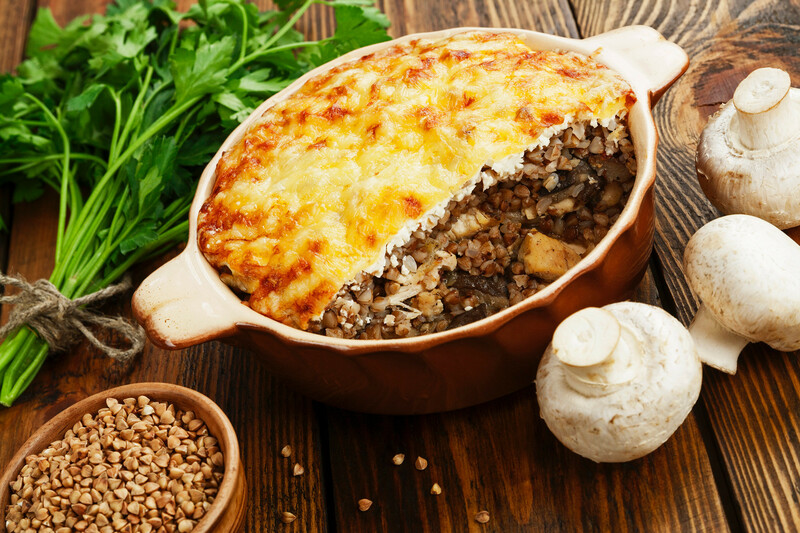 This type of zapekanka has meat, veggies, and of course buckwheat – Russia’s ultimate culinary delight. Side note: You can also cook this meal with any leftover meat from the previous dinner. Fry the chopped onion and mushrooms in sunflower oil for some minutes. Next add the ground meat until well done, dress with seasonings, and set aside. Meanwhile boil the buckwheat in slightly salted water. In a separate bowl mix grated cheese and sour cream. To make zapekanka layer the meat mixture on the bottom, then half the cream cheese, next the buckwheat, and finally the remained half of cream cheese on top. Bake for about 30 minutes at 180-200°C. Meet Russia's other perfect breakfast on a lazy weekend - oladyi.